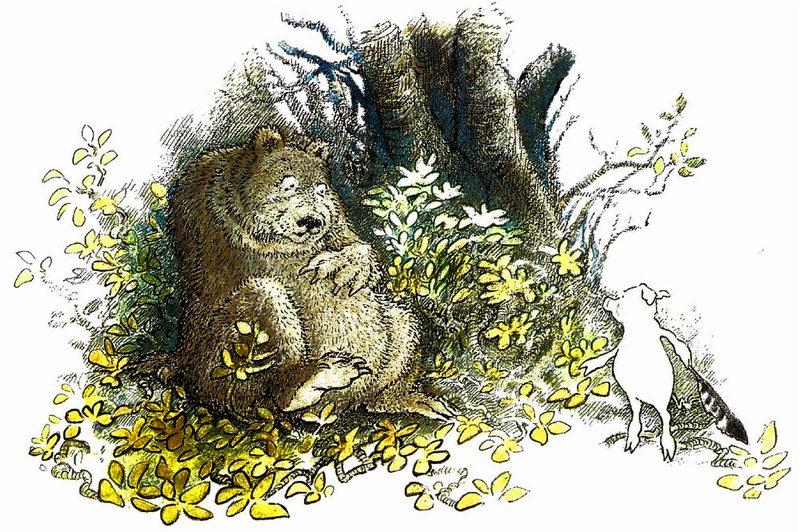 The story is gentle and sweet, with very little conflict, other than a slight inconvenience when Bear inadvertently wrecks the den of the first little pig, and Moose smashes the hut of the second. But don’t expect a fight, or any clever acts of retribution. 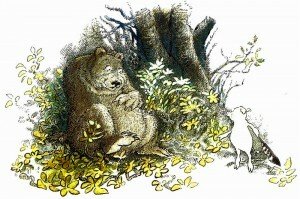 A House in the Woods is not the Three Little Pigs. There’s just two pigs, no big bad wolf, and the only huffing and puffing is in the service of building a home big enough for all four, with the help of a team of industrious beavers. In return for chomping down the wood, the beavers are paid in peanut butter sandwiches. Seems a fair exchange. 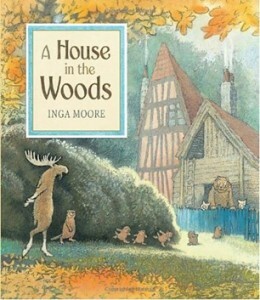 In spite of Inga Moore’s English and Australian background, this book appears to be set in Canada. Although it’s a generic sort of wood, the beavers are a dead giveaway. On the other hand, having recently traveled to Sweden where moose are the symbol of all things Swedish (sorry Agnetha, Bjorn, Benny and Anni-Frid), it is possibly some other boreal nation. Whatever the setting, the watercolour land and forest scapes are absolutely stunning, very much like Moore’s previous publications, the beautiful Wind in the Willows and The Secret Garden. Her lush and meticulously detailed style is perfect for these warm countryside stories, and as mentioned, solace to this foliage-starved northerner in February. 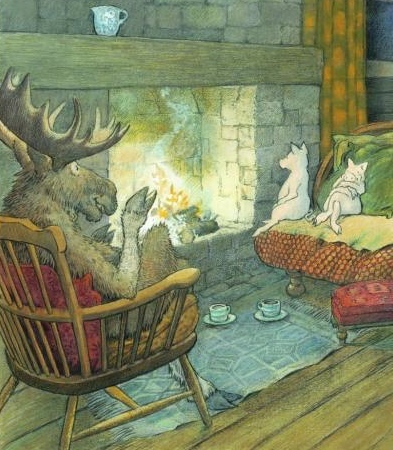 I want to wander the green hills and mushroom trails of her paintings, explore the cozy hidy-holes, and should I come across a house in the woods, meet Moose and Bear and maybe help the pigs make a few peanut butter sandwiches for those hard-working beavers. Inga Moore was born in England but moved to Australia in 1952. 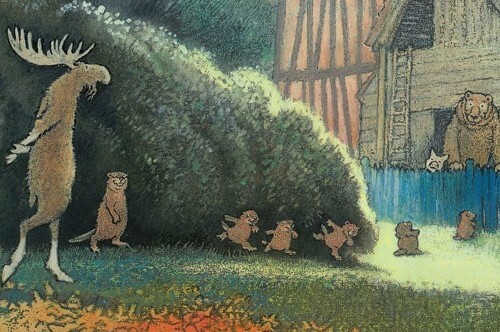 In 1981 she returned to England and devoted her time to illustrating picture books, including Kenneth Grahame’s The Wind in the Willows, Frances Hodgson Burnett’s The Secret Garden, and Six-Dinner Sid, one of her original publications. 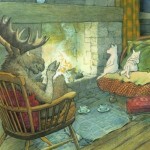 According to a 2010 article in the Guardian, Moore employs a variety of mediums to achieve her distinctive style, most often starting with photocopies her original drawings, then working with a mixture of pencil, ink, watercolour, crayon, pastel, even oil paint – “anything that works.” For many reasons, artistic and especially bibliotherapeutic, A House in the Woods works. It really works. Someone get Ms Moore a sandwich. One Comment for "A House in the Woods"